Drive to the bridge over the Fiora River between Farnese and Manciano. From there follow the unpaved road on the right side of the river for 3,5 km. N 4 2 ° 3 1 ' 3 8 . 7 7 " E 1 1 ° 3 6 ' 4 . 5 8 "
N 4 2 ° 3 0 ' 1 . 6 6 " E 1 1 ° 3 7 ' 5 . 2 4 "
At the Orvieto exit off the motorway, set your kilometer gauge at zero, and follow these instructions, keeping in mind that small differencies may be due to the conditions of tires. Outer belt road left around Farnese towards Manciano. Do not exit Civitavecchia. 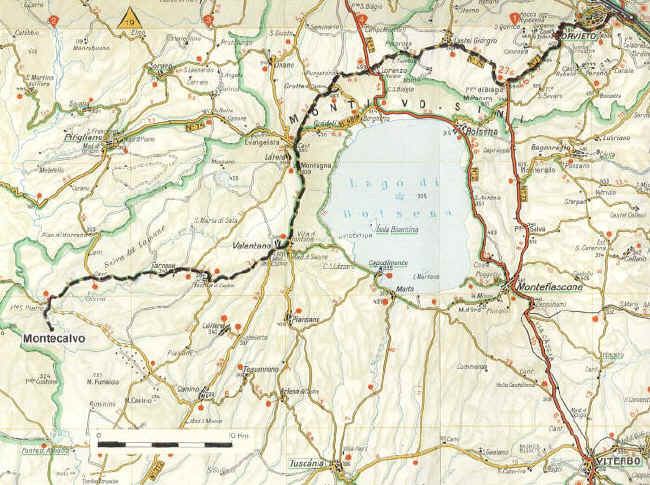 Reach the end of A12 and enter in Via Aurelia direction Grosseto (SS1 – blue road sign). Just before Montalto turn right, direction Canino Valentano (SS 312). After the mileage stone km 5 (5,7) turn left direction Manciano (SP Doganale). At the road sign 6 there is a first road direction Manciano: do not turn. At the road sign 12 (12,8) there is a second road direction Manciano: turn left. After 8 km of paved road plus 3 not paved road you will find bridge San Pietro, crossing the river Fiora. Cross the bridge and turn immediately to left. After 3,5 km you will arrive at Montecalvo.